You are currently browsing articles tagged Virginia. Statue of Captain Ripley which will be unveiled at the Marine Corps Museum on March 2, 2011. The memory of Vietnam hero and Navy Cross recipient Colonel John Ripley, will now be etched in stone, or more precisely, bronze. Members of Ripley’s Raiders have been working on a project to honor their heroic commander for some time. This looks to be a splendid tribute to a very great man. Those who wish to be a part of this historic project can visit the website which gives all the particulars. For a donation of $25.00 or more you will receive a Col. Ripley challenge coin. 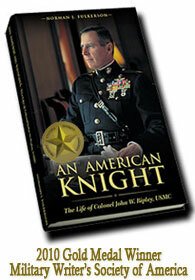 Those wishing to know more about Col. Ripley can obtain a copy of the first biography of the man by clicking here.